A critical requirement for software accessibility is keyboard support as a complete alternative to pointing devices (mouse, etc.). Keyboard support is comprised of navigation key, command key, keyboard navigation, and action keys. RadAsyncUpload seamlessly switches between mouse and keyboard navigation. As a part of Q2 2013 RadAsyncUpload control introduced fully built-in keyboard support. Setting the control's KeyboardNavigationSettings (introduced in R2 2016 - ver.2016.2.504), allows you to associate an activation combination (CommandKey + FocusKey), which moves focus directly to the RadAsyncUpload and enables keyboard navigation. When there are multiple AsyncUpload controls on a given page, each of them may have a different activation combination. Pressing the keys set to these two properties at the same time places the focus on the AsyncUpload. 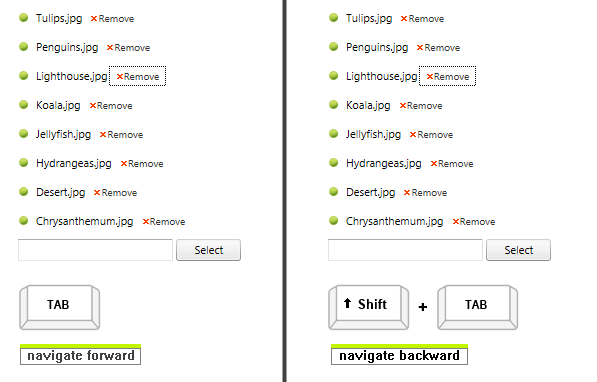 The user can then use the action keys for triggering specific action or the [Tab] key for navigation. To enable keyboard support for Internet Explorer 9 or earlier, you will have to set the DisablePlugins property to true . 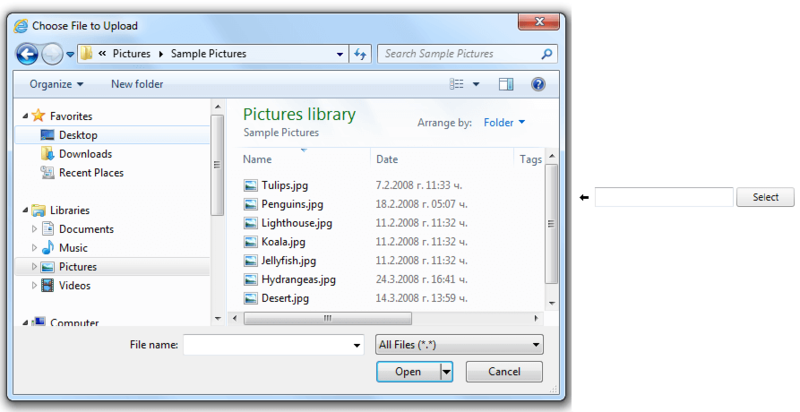 RadAsyncUpload uses [Space] key to activate the "File Upload" dialog window.